Offering standout style, outstanding safety gear and plenty of ways to customize, the new Santa Fe should be at the top of your list for new vehicle contenders, as noted by 2018 Hyundai Santa Fe reviews. Plus, buyers of the new SUV will have various engine options to choose from. Continue reading to see if the 2018 Hyundai Santa Fe in Arlington is right for you. Available in SE, Limited, SE Ultimate, Limited Ultimate, Sport, 2.0T and 2.0T Ultimate trims, the Santa Fe offers plenty to appreciate at all grades. Standard features 18-inch alloy wheels, LED running lights, heated outside mirrors and roof rails. Inside, you'll find dual-zone automatic climate control, an eight-way power driver seat, 7-inch touchscreen display, Bluetooth and a six-speaker sound system. 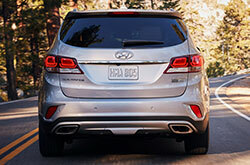 For more amenities, 2018 Hyundai Santa Fe reviews recommend going with the Limited trim. It comes with all the above, plus leather upholstery, LED taillights, keyless ignition/entry and a power rear liftgate for added convenience. The 2018 Hyundai Santa Fe in Arlington is powered by a 3.3-liter V6, making 292 hp and 252 lb.-ft. of torque as standard. It is matched to a six-speed automatic transmission. All trims give buyers the choice of front-wheel drive or all-wheel drive. The Sport trims (Sport, 2.0T and 2.0T Ultimate) can be had with one of two different engines. The first is a 185-hp 2.4-liter four-cylinder. The second, a 240-hp 2.0-liter turbocharger, is a good choice if you want a little more power while still getting enhanced fuel economy. Try all three engines at our dealership to see which is best for your lifestyle needs. 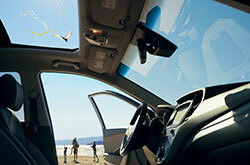 A plethora of next-gen safety gear can be found in all Santa Fe models. 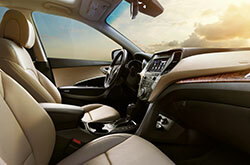 Standards include several high-quality airbags, antilock brakes and seatbelt pretensioners, to name just a few. Driver-assist technologies like adaptive cruise control, emergency braking with forward collision mitigation, lane departure warning and a 360-degree parking camera system are also available. 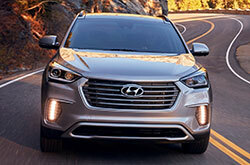 Scroll down to continue our review and learn more about the Santa Fe. 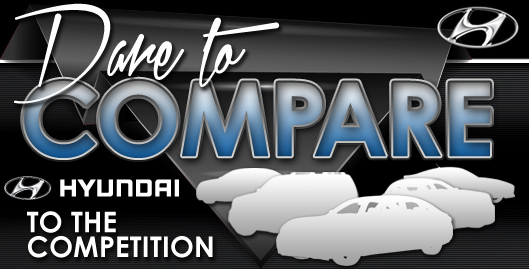 See video of the model, photos and third-party comparisons that make it easy to see how the SUV stacks up against competitors. Once you finish our review, schedule an appointment for a test drive using our online form. 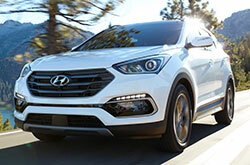 Want More Specs on the Hyundai Santa Fe? Don't settle for the 2018 Toyota RAV4, Chevrolet Equinox, Mazda CX-9 and the Ford Explorer when looking for new vehicle models; visit Vandergriff Hyundai to view the likable 2018 Hyundai Santa Fe in the Dallas metro area. Its assortment of features and magnetic personality may be just what you need in an everyday vehicle. Now that you're about done with our 2018 Hyundai Santa Fe review page, make sure to check out current Hyundai Santa Fe financing incentives offered at Vandergriff! We're a local Hyundai auto dealership where you can find great incentives - not only for the Hyundai Santa Fe, but also for other new and used cars. We've included this 2018 Hyundai Santa Fe review on our site to make it less complicated for you to find the specs you need to make an educated vehicle purchase. 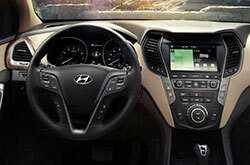 Explore the Hyundai Santa Fe in Arlington, TX; requesting a test drive at Vandergriff Hyundai is a smooth process with our email form. Are you hoping to get a peek at its cabin equipment prior to your visit? See the embedded video.